Full Disclosure: I paid for this dessert with my own money and the opinions in this post are completely my own. One of the things that I think added a lot to Healthy Living Summit this year was the mini-mingles. Healthy Living Blogs put together a few different small gatherings for people to get to know each other a little bit before the actual summit began. There was a trip to Whole Foods, a photo walk, and more. 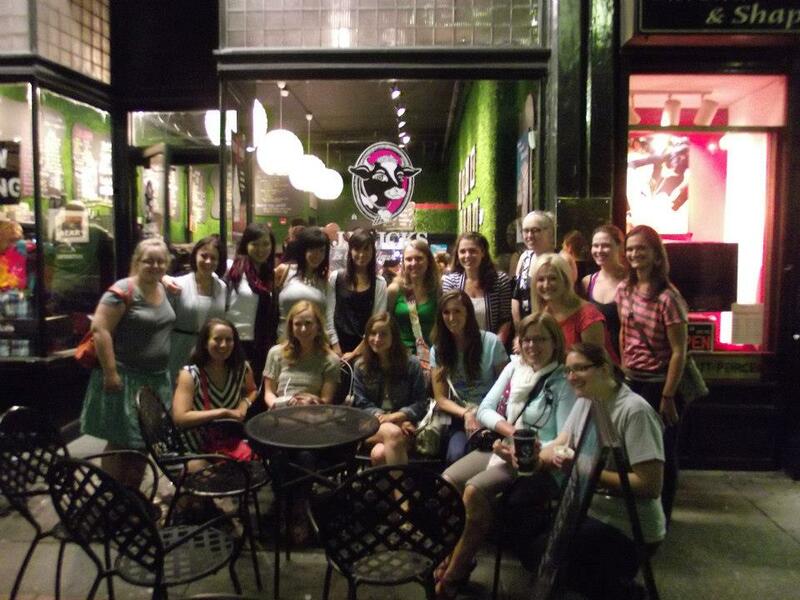 The mini-mingle that I attended was the frozen yogurt outing. (This should surprise no one) It was led by my awesome roommate Alicia on Thursday night. After a looooonnnnnggggg day of travel, and sitting at airport, I was more than ready for some frozen yogurt. 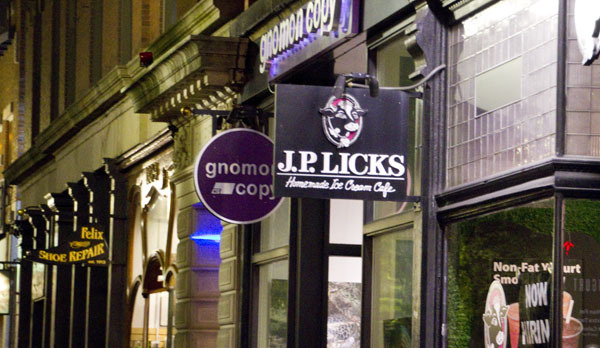 A bunch of people headed to JP Licks for some dessert – they have ice cream, frozen yogurt, sorbet, and more. They really do have a little bit of everything. I was looking forward to some frozen yogurt, so that is what I got. 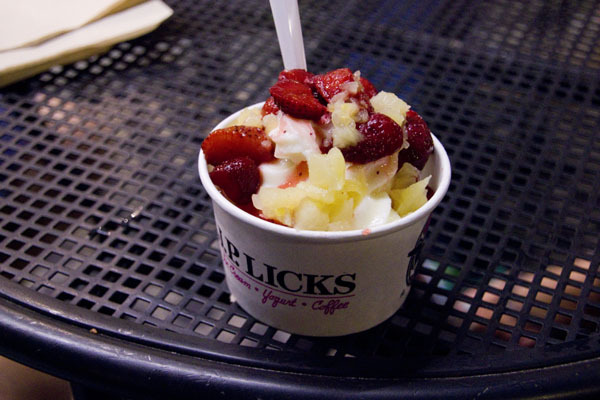 Tart soft serve frozen yogurt with strawberries and pineapple. The yogurt itself was good, delicious tart flavor and perfect consistency, but the fruit seemed like it had been defrosted from frozen, and was a little mushy and definitely sweeter than normal. 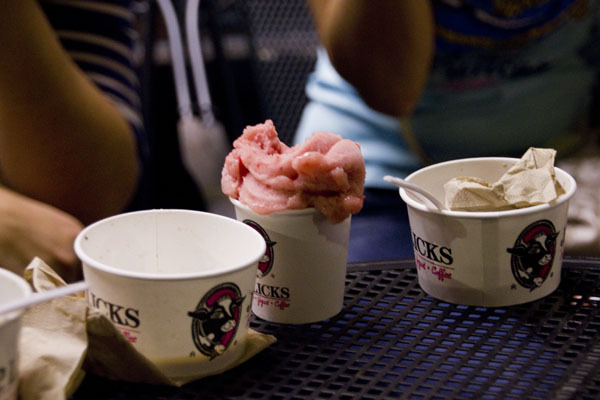 Other people had various kinds of ice cream, yogurt, and sorbet and everyone seemed to like theirs. We also ended up getting some Sangria Sorbet for a bunch of us to share. I’m not sure how I missed this the first time around, but I’m glad we got to try it because it was delicious!! It was fruity but it also had a bit of an wine taste. Really yummy. Although it was a little bit overwhelming with so much to choose from, it was a delicious choice for dessert, and a great group gathering! Taste: A, aside from the fruit everything else was great. Cost: A, it was a little higher than I’d pay at home, but for the area the price seemed pretty good. Would I go there again? Yes. I wish somewhere closer to me made Sangria Sorbet! YEsssss! I cannot believe that we didn’t have any ACTUAL SANGRIA over the weekend though!! Next year we need to take like a week off so that we can have a few days to relax and just hang out with each other! !